From “Up on the Roof,” to “One Fine Day,” to “Locomotion,” the Tony Award-winning “Beautiful: The Carole King Musical” bursts with the high energy and good vibes of the hugely popular classic jukebox hits written by Carole King and Gerry Goffin in the ‘60s. But for Sarah Bockel, the actress who plays King in the touring production of the record-breaking Broadway play that returns to Boston on Jan. 29, the song that evokes an evocative chord is “Natural Woman.” In a transformative and emotional-laden scene, King’s producer, Lou Adler, asks her to record the song she originally wrote with Goffin for Aretha Franklin. It was a critical transition in King’s life, personally and professionally. Her marriage to Goffin had ended in a heartbreaking divorce. She was recording “Tapestry,” her first solo album. King was hesitant, even reluctant about recording “Natural Woman,” Bockel said in a phone conversation with the Journal. Bockel also sees signs of King’s strength in the scene, where she pushed past her own self doubts and is on the verge of discovering that she is good enough to record as a solo artist. Presented by Broadway in Boston, “Beautiful” runs through Feb. 10 at the Boston Opera House, where it first played in 2015. Bockel was then the King understudy and in the ensemble. Her portrayal of the music icon has evolved in her nearly 1,000 performances in the role, giving her the chance to explore new perspectives that keep the performance fresh, she said. Bockel first auditioned for the Broadway play more than five years ago. Since then, she’s been in the Broadway ensemble; understudied two actresses who played King; and filled in the lead role for six weeks in the New York spotlight. “I’m like an encyclopedia of knowledge about her life,” she said. King, who will celebrate her 77th birthday on Feb. 9, was born Carol Klein, and raised in a Jewish family in Brooklyn. From the opening pages of her memoir, where she recalls the journey of her Jewish immigrant grandparents, King reveals her deep emotional connection with her family’s Jewish heritage. King credits her grandmother’s love of music with inspiring her career. Bockel said that growing up in a Catholic family in Chicago, where she attended Catholic schools, helped her understand the role Judaism played in King’s life. “I definitely know what it’s like to have close ties with your religion,” she said. Watching the award-winning Netflix series, “The Marvelous Mrs. Maisel” gave her a feel for the time and New York City’s Jewish culture, Bockel added. The bio-musical traces King’s early years in the 1960s, crafting tunes with Goffin for chart-breaking recordings by the Shirelles and the Drifters, among others. The show follows King through her emergence as a solo singer-songwriter, beginning with her breakthrough 1971 album “Tapestry,” which won four Grammy awards and has sold more than 25 million copies. “Beautiful” has scored high points for portraying the friendly competition and notable collaborations with the husband-wife team, Barry Mann and Cynthia Weil, Jewish composers of such hits as “We’ve Gotta Get Out of This Place.” Mann is played by Jacob Heimer, who grew up in Connecticut. He is the grandson of Holocaust survivors. Bockel is looking forward to returning to Boston, fondly recalling easy commutes on the T to the theater and strolling around the city. The thoughtful and lively conversationalist takes pride knowing that young theater-goers are discovering King’s inspiring life of breaking boundaries in a male-dominated profession. It’s a message that resonates now with the emergence of the #MeToo movement, she said. “It is not just a jukebox story about an icon. It’s also an authentic story for women to soldier on,” Bockel said. She admires King’s bright-looking life perspective. “Sometimes life goes the way you want. But when it doesn’t, you find something beautiful,” she said, referring to the name of King’s hit song that closes the show. 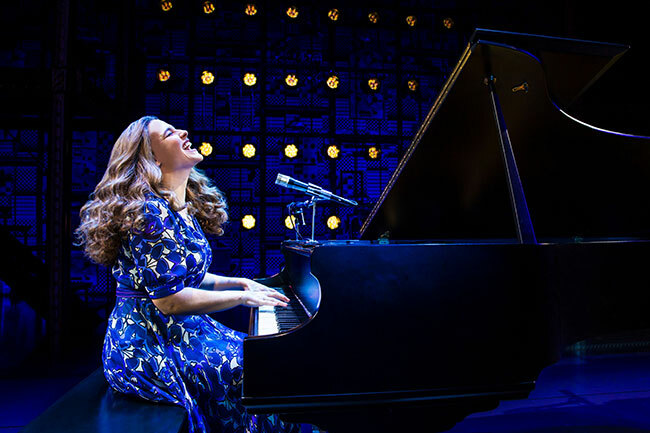 “Beautiful: The Carole King Musical” at the Boston Opera House, Jan. 29 to Feb. 10. For more information, visit broadwayinboston.com.